A mixture of pork sausage, baking mix and shredded cheddar cheese is rolled into balls, then baked for delicious hot appetizers or snacks. Roll into 40 (1-inch) balls. Place in single layer on rimmed baking sheet sprayed with cooking spray. Bake 15 min. or until sausage is done and balls are lightly browned. Trim 40 calories and 5.5g of total fat, including 2g of sat fat, per serving by preparing with turkey sausage. Set out smaller plates of hot appetizers and replenish them more often to ensure they remain at a hot safe-to-eat temperature. 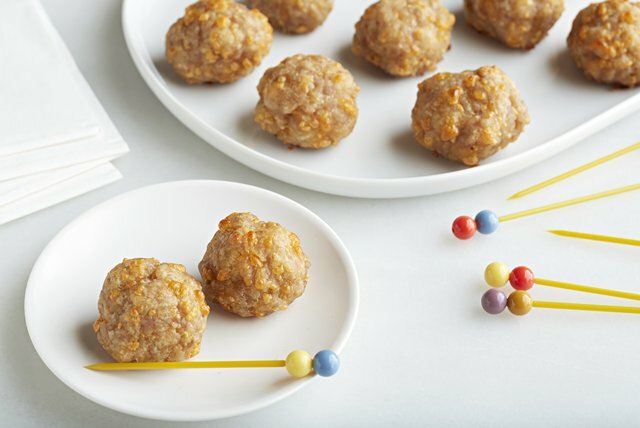 Sausage mixture can be shaped into balls ahead of time. Refrigerate up to 24 hours. Bake as directed just before serving.